I’ve got a busy weekend planned. I hope to make a serious dent on my dissertation edits (you know, for the dissertation that won’t go away). My ‘lil cuzzo RJ (Russell, Jr.) is graduating, and a big bash is planned. Thankfully I won’t have to go in search of Memorial Day barbecue – his Mom and Dad are great cooks and they’ve already promised to throw down. (Expect photos). They’re also super at zydeco dancing so maybe I can persuade them to show me a few steps. (Yes, that’s still on my “things I wanna learn” list). I’ll be back next week. 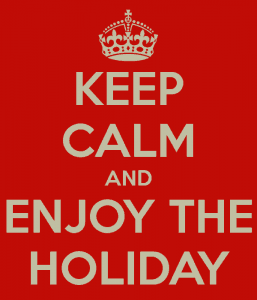 Till then, enjoy the holiday! Join in the Fray: What are you doing for Memorial Day weekend?